Getting feedback on customer service is notoriously challenging. Customers are busy and don’t often have time to spare. 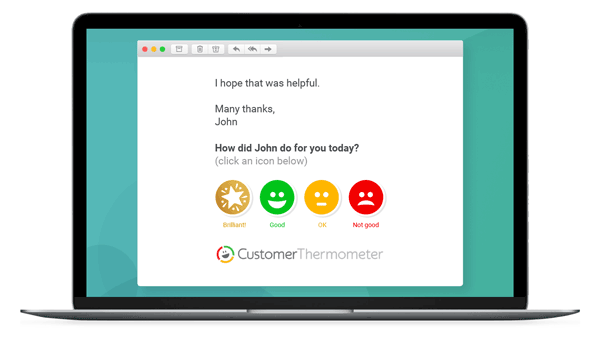 We spoke to Customer Thermometer user Lanteria about their success at getting and using feedback on its customer service. Lanteria is a leading developer of HR, Talent, Performance and Learning management software for SharePoint and Office365. We provide a “hire-to-retire” HR Management System called Lanteria HR. The company is HQ’d in Boston, Massachusetts. When and why did you start using Customer Thermometer? Lanteria started using Customer Thermometer‘s l-click feedback solution in November 2016. The main purpose was to get as many honest pieces of feedback from our clients as possible. We needed to know what the clients thought about the quality of our services, the response times to any issues they raised, and our ability to address each and every issue properly. How do you use Customer Thermometer? We have integrated Customer Thermometer with our Zendesk ticketing system (this is the system that serves as a support portal for Lanteria’s clients). Once a client’s support ticket is closed – the client immediately receives a 1-click feedback survey to gather their opinion about Lanteria’s support services. During our entire history of using the product, Customer Thermometer has always been stable and reliable, and completely convenient for our clients. Yes! The Customer Thermometer tool has made a great contribution to our work. Our clients and their needs are the top-level priorities for us. Using Customer Thermometer gives us the opportunity to become much better as a professional organization and to learn a lot from client feedback. We are strong believers in the saying, “Learn all your life” and this helps us to do that. We would definitely recommend Customer Thermometer for any organization that values the needs and the feelings of their clients.